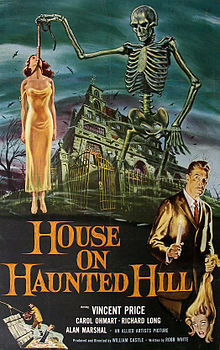 House on Haunted Hill is a 1959 American horror film directed by William Castle. The film was written by Robb White and stars Vincent Price and Carol Ohmart as eccentric millionaire Frederick Loren and his wife Annabelle, who have invited five people to the house for a "haunted house" party. Whoever stays in the house for one night will earn $10,000. As the night progresses, all the guests are trapped inside the house with ghosts, murderers, and other terrors.The film is in the public domain.Eccentric millionaire Frederick Loren (Vincent Price) invites five people to a party he is throwing for his fourth wife Annabelle (Carol Ohmart) in an allegedly haunted house he has rented, promising to give each $10,000 with the stipulation that they must stay the entire night in the house after the doors are locked at midnight. The five guests are test pilot Lance Schroeder (Richard Long), newspaper columnist Ruth Bridges (Julie Mitchum), psychiatrist Dr. David Trent (Alan Marshal) who specializes in hysteria, Nora Manning (Carolyn Craig) who works for one of Loren's companies, and the house's owner Watson Pritchard (Elisha Cook). Pritchard disapproves of Loren's use of the house for his "party," making it unclear how Loren acquired access to the house in the first place.